Heritage for Peace on panel of UNESCO Experts meetingFrom 26-28th May UNESCO held a meeting of experts looking for ways to safeguard the heritage of Syria. More than 120 people from numerous countries and organisations attended. The meeting was themed around built heritage, movable heritage and intangible heritage, and a large amount of information on these topics was shared by all involved. Heritage for Peace were asked to sit on the built heritage panel and present their work, which was positively received.The meeting called for greater cooperation between those who wish to help Syria, and announced the formation of a new observatory to monitor, coordinate and direct projects. To read the UN News Centre Press release, click here. More details to follow. Heritage for Peace presented their work, and formed important new contacts to allow us to work to assist the Syrians to protect their heritage. The conference reviewed what actions are currently taken to mitigate the destruction of cultural property during conflict, and the ensuing discussions offered suggestions for ways forward. Whilst the destruction of this synagogue has been falsely reported several times, it would appear that this time, the reports are true. Unlike the previous reports, which have no supporting evidence, photographs published by the Daily Beast show the rubble left after the Eliyahu Hanabi Synagogue in the Jobar neighbourhood of Damascus was apparently shelled over the weekend.There has been no mention of casualties. In addition, reports vary as to whether all objects within the synagogue were removed into safekeeping, or only some. Many seem to have been removed. There have also been some reports of looting: these appear to (mostly) relate to objects such as the chandeliers, rather than more significant objects. 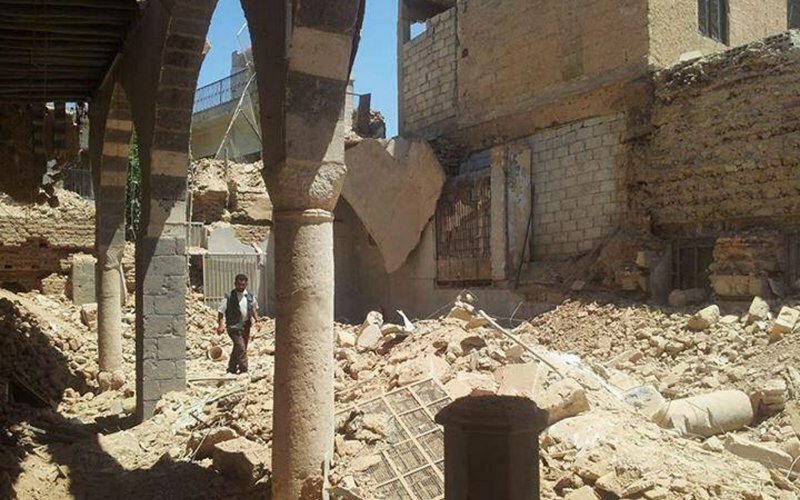 Lastly, it is worth noting that whilst many reports place the building at 2000 years old, it is a 400 year old synagogue over a far more ancient cave site.The Daily Beast report, Exclusive Photos: Syria’s Oldest Synagogue Destroyed, can be viewed here. Journalist Franklin Lamb has apparently viewed some of the objects moved for safekeeping, and met those protecting them. His report of events, Syrians Working to Preserve Jewish Cultural Heritage, can be read here. Photos posted by the Facebook group Syrian Perspective show the destruction of the shrine in mid-May, and are available here. Uwais al-Qarani “lived during the lifetime of Prophet Muhammad (peace be upon him) and was considered a companion of Imam Ali”. 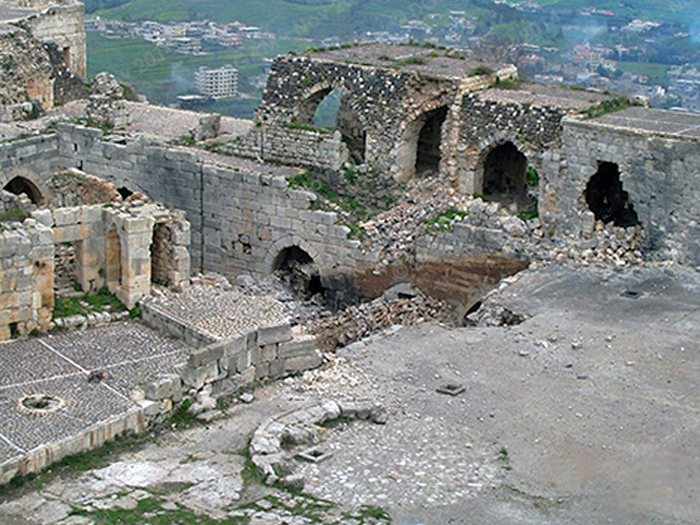 The World Monuments Fund have released a set of ‘before and after’ images showing the damage to the World Heritage Crak des Chevaliers, available here. Journalist F. Lamb has also recently visited the fortress (15 May 2014), where he was shown around: he has written a catalogue of the damage. In addition he noted ongoing restoration work, and provided the date of the planned launch to reopen Crak des Chevaliers to the public – 1 June 2014. His report, Liberating Syria, published in MWC News, is available here. After armed groups apparently set fire to the Church of Um Al-Zenar before they left the area of Homs, cleaning and restoration work has begun. A photo of the work was shared by Syria Heritage and can be viewed here.Journalist Franklin Lamb recently visited the Church, and reported that the Church, “which these days is a partially burned out shell devoid of pews and religious artifacts, held its first Holy Communion since the conflict began.”Read his article, Syrians Working to Preserve Jewish Cultural Heritage, here. The site of the current Church is said to date to 59AD, and the current liturgy is also apparently 1st century. The church held a belt reputed to have been worn the Virgin Mary: however it has been the subject of extensive damage. 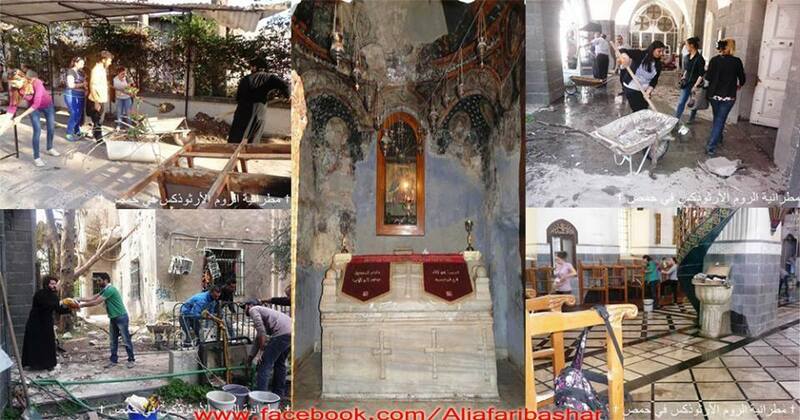 Photos were released by SANA confirming that the church has sustained extensive damage, and showing the state of the church before. These can be viewed here, together with a brief report. We previously posted about a song about the damage to Aleppo:”Click here to listen to a song by Kinana Allouche called “A tour of the Old City of Aleppo”. The music is traditional Middle Eastern music, but the words and video are of the damage.”We apologise for the confusion, and would like to clarify. The song is traditional in style, but is a completely new piece. 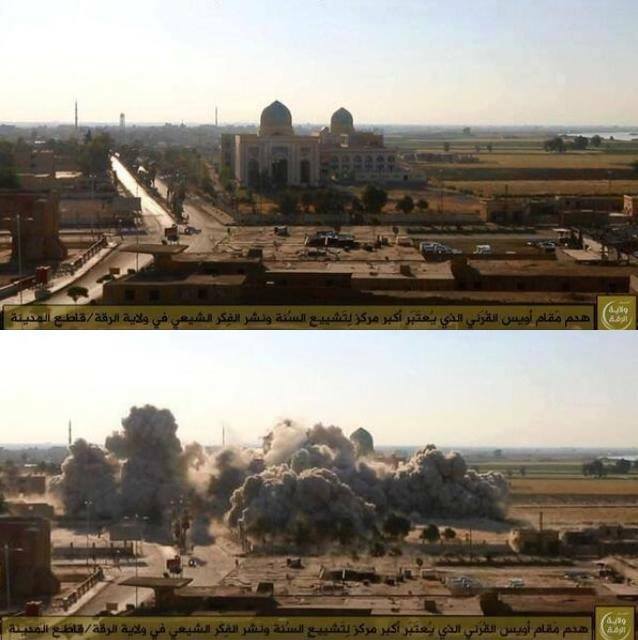 Hama – Tell Othman: earthen dykes and installation of heavy weapons in the archaeological site area. The YouTube report is available here, and the satellite images and YouTube stills are available here. They have released a YouTube video showing the damage done by the extensive looting at Apamea, available here. They have released a photo of the damage at World Heritage Palmyra, caused by earthen dykes and installation of heavy weapons in the archaeological site area, available here. Syrian antiquities are seeping onto a glutted market, driving down prices. Lebanon, for example, is catching shipments about twice a month.Read (or listen to) the full article, Smugglers Thrive on Syria’s Chaos, Looting Cultural Treasures, in NPR Parallels here. This (pdf) report was presented at the UNESCO experts meeting in Paris and shows the excellent ICT tools they are using to protect their heritage.Gerrouge, T. 2014. Dedicated ICT Tools to Help Heritage Professionals Register, Retrieve and Share Data about Areas in Conflict, available here. A workshop was held on the 21st May at the National Museum in Damascus in collaboration with scientists from the Directorate of Antiquities and Museums, buildings and documentation, legal affairs and management of sites and world heritage sites. The workshop discussed criteria for registration and preservation of monuments in Syria, and developed a better methodology. It was developed with government agencies, the Ministry of Local Administration and Housing in the province of Damascus, the Ministry of Religious Endowments (which has a large number of religious buildings of archaeological importance), the Ministry of Tourism, and all interested members of civil society, particularly the Friends of Damascus Group.The DGAM report, Facts and documents of the Workshop on maintaining standards and archaeological registration, is available here. A second report, Building a cultural heritage protection: Workshop on Standards to preserve archaeological data, was published by Syria Here. (Both reports are in Arabic). We apologise to the DGAM, who have several other updates on their website, but H4P has been away for the last two weeks and unable to access them, and their website is currently down for maintenance and further updates. We will share their information as soon as possible. At the meeting of international experts on 26-28th May, UNESCO announced plans to create an observatory to monitor the situation, share information, and coordinate and direct responses. The press release, With Syria’s culture near ‘point of no return’, UN agency to create safeguard observatory, is available here. A conference was recently organised by DAAD (Deutscher Akademischer Austausch Dienst – German Academic Exchange Service) entitled Preserving the Past – Constructing the Future. Cultural Heritage and Social Development in the Arab World. It brought together archaeology experts, who used the platform to discuss the future of the region’s cultural heritage and the need to protect and preserve historical sites in the Arab Spring countries. Photos from the conference are available on the Change by Exchange Facebook group here. In addition to Lamb’s report on Syrian’s working together to protect their heritage (Syrians Working to Preserve Jewish Cultural Heritage, available here in Counterpunch), UNESCO are also reporting on the work the Syrians are doing to protect their heritage.Syrian citizens are protecting their cultural heritage, UNESCO, (no date), available (in Arabic) here. A report from Tell Mozan also indicates that local people who worked as part of the excavation team are doing their best to protect the site.Read the report (it’s well worth reading), In the Eye of the Storm, by G. Buccellati, here. The Art Newspaper has reported on the damage and looting of Tentative World Heritage Site Maaloula.Ancient Christian sites in Syria threatened, the Art Newspaper, 28 May 2014, available here. Conflict threatens Syria’s remaining heritage, Al Jazeera English, 27 May 2014, available here.